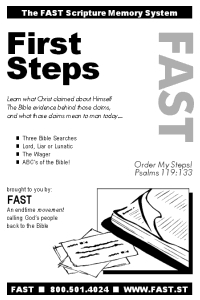 An exciting three lesson course designed to introduce an honest seeker to the claims of Christ, the evidence behind those claims, and what those claims mean to man today. Includes adaptations of the Trilemma by C.S. Lewis and the Wager by Blaise Pascal, an introduction to Old Testament prophecies of the Messiah and a clear presentation of the Gospel. $3.00.